Nine Free Library of Philadelphia locations are testing out a fun new take on an old classic! These new audio-enabled books from Vox Books are picture books combined with an audio recording of someone reading the story. But, wait! Instead of needing a CD or tape player, or a smartphone or tablet, the audio component is embedded in the book itself, in the form of an attached 5mm digital player. The sound can be heard through the speakers or via headphones, and is started with the simple press of a button! 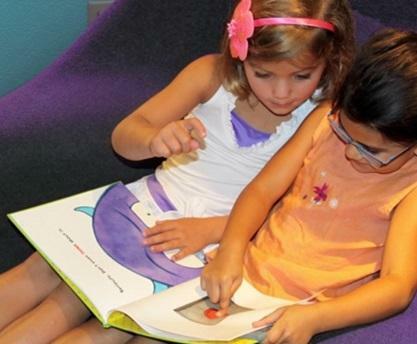 Nine Free Library locations – Wadsworth, Joseph E. Coleman Northwest Regional, Bushrod, Torresdale, Haddington, Eastwick, Kensington, Richmond, and Whitman libraries – are piloting the new books to see if beginning readers, English language learners, and families enjoy the new format. Each location received 44 titles, a mix of fiction and nonfiction ranging from pre-K to third grade interest and reading level. Try them out today, and let us know what you think in the comments section below! Nine Free Library locations are piloting the new audio-enabled books from Vox Books! 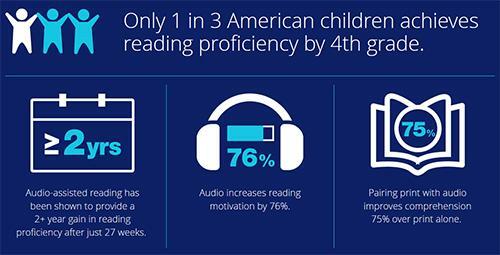 Only 1 in 3 American children achieves reading proficiency by 4th grade. Add a Comment to Explore New Audio-Enabled Books at the Free Library!